We might learn a lesson from the ant. He harvests his supplies when they are available and stores them up against the day when it would not be possible to obtain them. The result is that his larder is usually well stocked. The grasshopper, a much larger insect, does not operate that way. 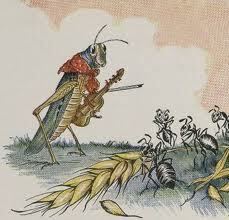 He does not lay up anything in store for hard times, but depends upon providence to provide him what he needs, and the result is that most grasshoppers starve to death. I fear that some human beings are like the grasshopper and do not take advantage of the opportunities that are theirs in a reasonable way. If they would take a lesson from the ant, they would lay up the food that they need and always have some on hand. Self Reliance such as knowing how to repair, raise a garden, etc. These are all good, but I can see where people could interpret scripture to mean that we should be grasshoppers instead of ants. For example, Jesus teaches in both the Book of Mormon and Bible to “take no thought for your life what you shall eat, or what you shall drink; nor yet for your body what ye shall put on…” (the Book of Mormon shows clearly that He is talking to the apostles and not disciples in general. However, the Bible isn’t as clear about singling out the apostles). According to that scripture, it would seem that Jesus is admonishing us to not worry about worldly things and all we really need to worry about is following Him and He will provide us with what we need. I can see a benefit of both. For practical reasons, it is good to prepare for the future. However, I can see why people think doing so is a lack of faith since the scriptures seem to show a case for doing it either way. What are your thoughts? Are you a grasshopper or ant, and why? Ant. My parents were married during the depression. They taught me well. Ant, look at what happens now, when there is a storm, or out of work or w/e. Having those things to help support you and your family in time of need will help. Good points. I wrote this prior to the hurricane back east and that is a good, very recent reminder to be prepared. This is why a modern prophet is worth more than all the writings of past prophets. They teach us to get out of debt, store a years supply of food and water, save money for a rainey day. I will follow what the Savior is telling us through a living prophet.